Intended use: Lifestyle/Casual use. Not meant for running. Upper: Two tone stretch mesh, Tirrenina Suede, Rubber. The PureBoost Reveal might have the largest Boost midsole, but it ain't no runner. It is a lifestyle sneaker at best, good for walking around with lots of midsole cushioning. Tons of faults crop up once you start running in them. Dear adidas, why take a lifestyle sneaker and categorize it as a performance running shoe? The adidas PureBoost easily takes the prize for being the worst running shoe we’ve come to test in recent times. ‘Hang on a sec,’ you’d say. ‘Isn’t the PureBoost a lifestyle sneaker?’ Not according to Adidas. The German brand lists the shoe as a performance running product on their webpage, along with genuine notables such as the Energy Boost and Supernova Glide Boost. Not sure what the good folks at Adidas were smoking, but it had to be pretty strong for them to classify the Pureboost as a running shoe. The latter is anything but. Reverse side of the stretch mesh. 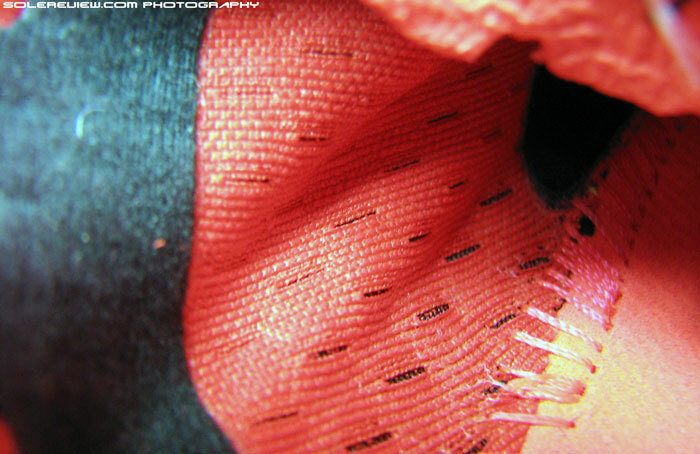 Two colors (red+black) of yarns are woven together, and not printed. We’re reviewing the PureBoost Reveal today, a variation of the original PB released earlier this summer. Everything is same, except for the type of upper mesh used, which happens to feature a two-toned design. 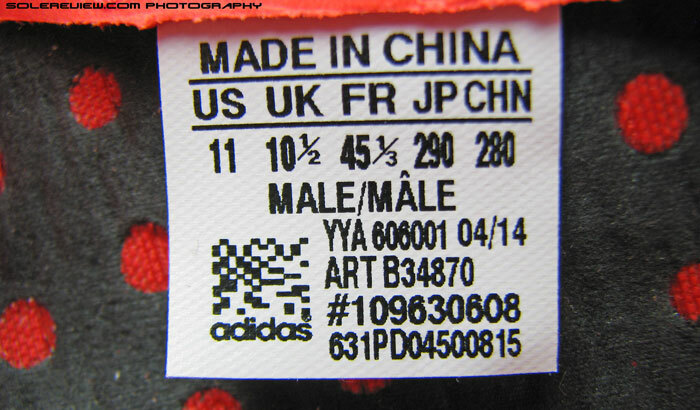 Adidas’ website describes the PB upper as ’synthetic with all over print’, but that is erroneous. The two tone aesthetic is made possible by using two differently colored yarns with stretch elements woven in, and not printed over. The Pure Boost has an exceptionally chunky Boost foam midsole – the largest of all Boost shoes. To be honest, we were intrigued by the PureBoost when it released in May. It was a bit of an enigma, really. It featured a full length and highest volume Boost midsole (in its peer group). And yet it was $120, a full 40 below the Energy Boost. On paper it sounded good; a seemingly minimal upper construction combined with the Boost foam we so loved in other adidas models. There was also a write-up going around which talked about how the shoe was designed by a team of adidas designers which included Ben Herath, who oversaw the adizero Adios and OG Energy Boost’s creation. If that didn’t sound good, what did? So we bought the PB and went for a few runs. As you must have already guessed from our overtly negative preamble, the experience was a crushing disappointment. Two tone mesh, capped with a rubber toe bumper. Eyestay is made of fused-on rubber. Sides get welded rubber stripe treatment. In an effort to best explain PureBoost’s multiple follies as a running shoe, we first need to do a quick rundown of the shoe’s construction and design. The upper is minimal, using a stretch mesh which extends from the forefoot to rear, a point after which other materials take over. Overlays are built by means of a thick, no-sew rubber layer which forms the toe bumper, the adidas three stripes logo on both sides and finally the four eyelet row eye-stay. The eye-stay continues downwards towards the rear-foot, and overlaps the seam joining the stretch mesh and synthetic suede section together. 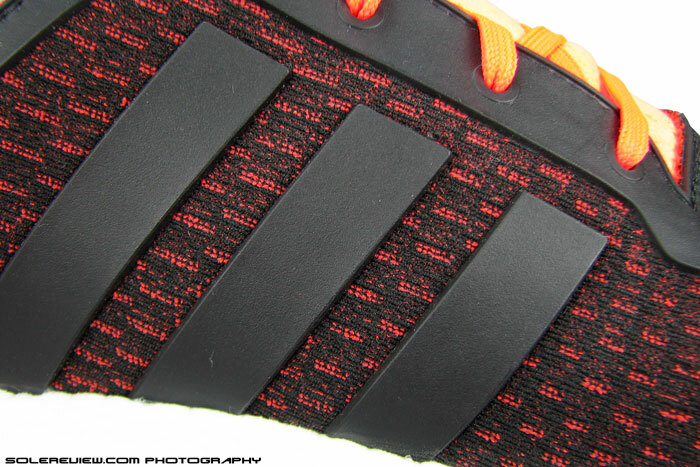 Only the base of upper heel has an internal stiffener (area over which adidas logo is welded on). Rest of the heel has a deconstructed set-up. Tongue and heel portion is built using Tirrenina Suede, same as what was used on the Adios Boost 2. 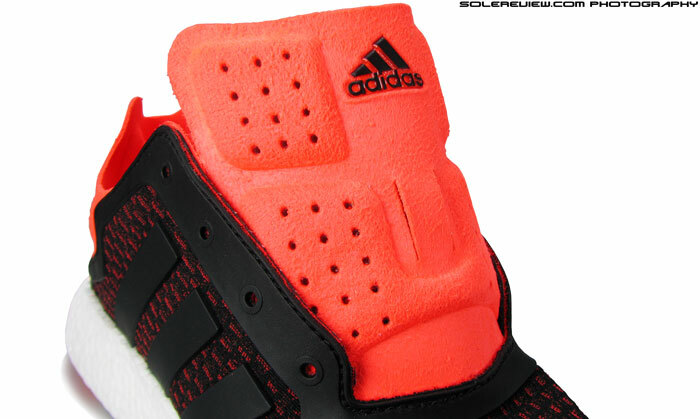 Inside heel has these padded pockets for grip. When worn barefoot, these pods tend to stick to bare skin. There’s a rectangular (embossed) pocket near the tongue, but isn’t of much utility. The heel has a deconstructed look, and is made of synthetic Tirrenina suede, which is also used in the Adios Boost 2. The heel lacks a full size internal stiffener, instead relying on a smaller piece – which gives some rigidity around the base over which a adidas logo is welded on. Inside, there’s no fabric lining but a second layer of smooth synthetic bonded with suede. The collar edges aren’t padded with foam, and grip is delegated to two embossed (and foam sandwiched) pockets on both sides of inner heel. The portion near the tongue has a pair of rectangular-shaped embossed pads flanking the foot on inner and outer sides. Here, in addition to two layers of fused synthetic, the rubber eye-stay also overlays on top of them, making the collar edge a three layer deal. Tongue top is synthetic Tirrenina suede. The edges are firm though, and are a bother during barefoot use. They poke. Reverse side of tongue has four padded pockets, with a smooth texture. There is no insole in the Pure Boost. 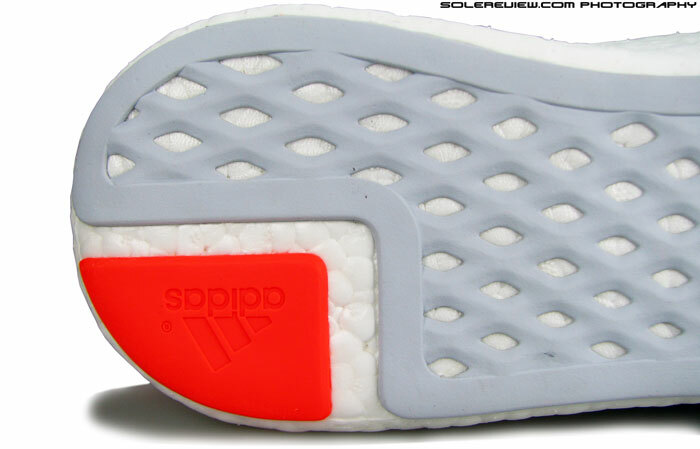 The strobel doubles up as one, its angular perforations showing the Boost foam through. A second layer of lining with perforations is fused to the upper. Tongue is an ungussetted piece constructed using two layers of synthetic suede, similar to the going-ons in rear-foot section. 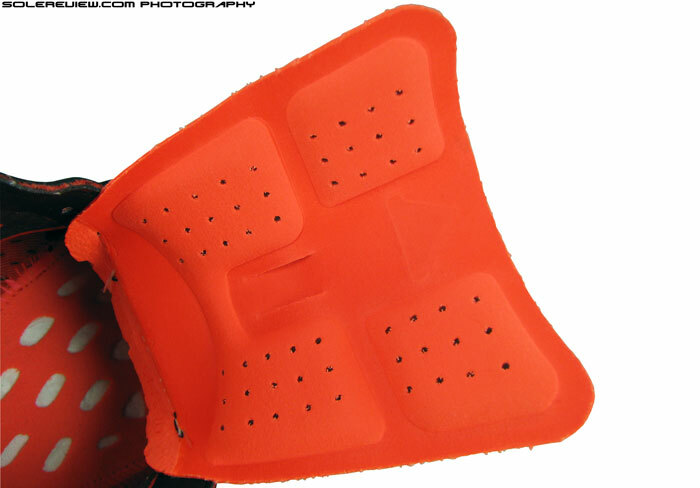 Doesn’t have allover padding, but provides two pairs of sandwiched foam pads which sit over the foot. Inside of the PureBoost midfoot is lined with another thin mesh with circular perforations in them. Also worth mentioning is that the PureBoost lacks an insole; only a thin sheet of synthetic separates the foot from Boost foam. The strobel has scores of angular cut-outs, and you can see the midsole right through it. 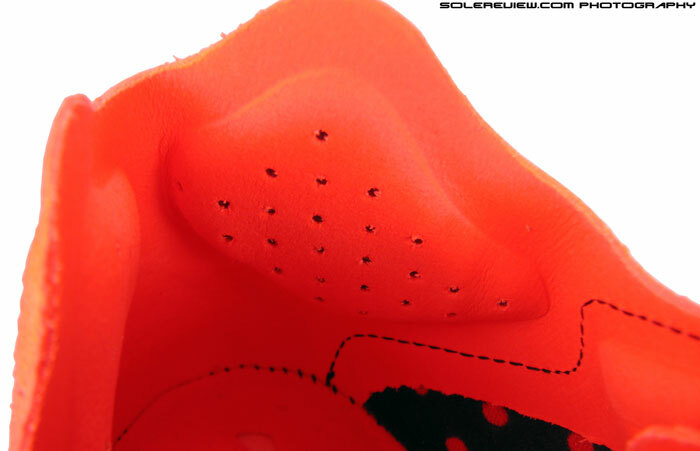 Outsole profile is flat, and is covered with a very soft layer of rubber. Red part is more firmer than the rest. Midsole, as the shoe name suggests, is unadulterated Boost foam. 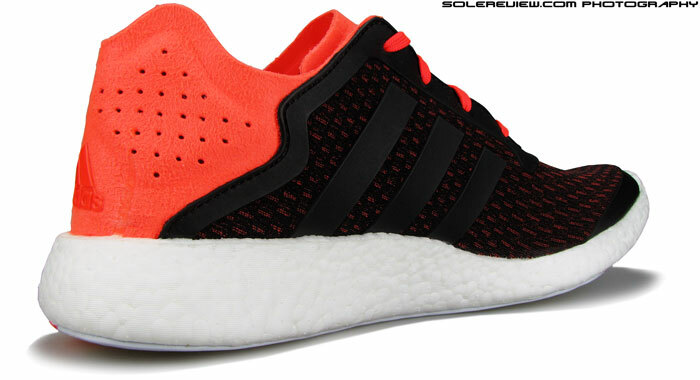 There’s nothing except the single bed of Boost between the upper and outsole. Speaking of the latter, there are three pieces of rubber attached to its underside. 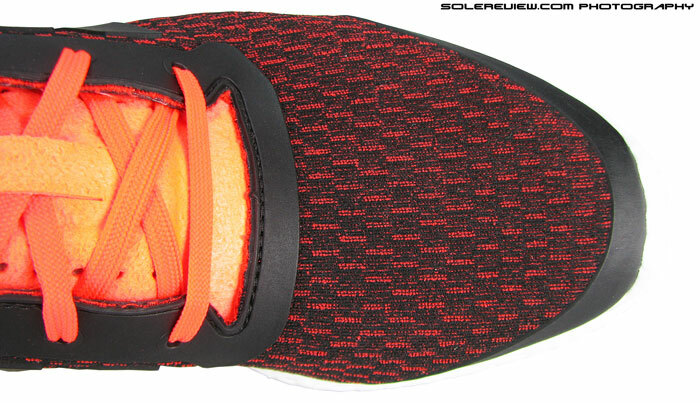 What the picture won’t tell you about the outsole is how soft these pieces are. The red heel bit is a bit firmer, but the white rubber is extremely soft. It is not very grippy though; the surface texture feels like that of a fresh out of the wrapper Wrigley’s gum. Strange analogy, but the closest we could think of. Looking sideways, heel to toe drop seems massive. Don’t exactly know how much, could be 12 mm or more. Now coming to the wear-test. We thought an initial five miler would be a good way to kick things off in the PureBoost. The experience was rewarded with mild soreness in multiple areas below the thigh section. Nothing which stayed for more than 24 hours, but this was a reflection of how the shoe behaved. The second five miler was better, with less soreness felt. We are of the opinion that the PureBoost fundamentally lacks support of any kind; transition quality has a component of strangeness seldom seen in modern running shoes. 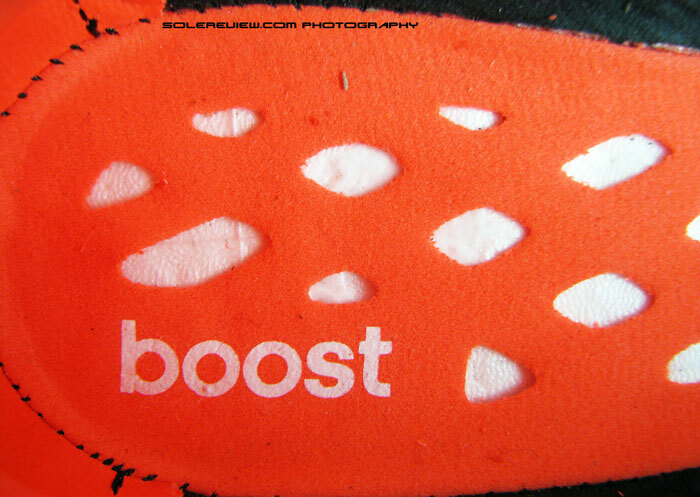 Midfoot of the Pureboost tends to roll-in excessively; so much so that the midsole walls of the Boost foam makes contact with the ground. Hard to believe or have difficulty trying to mentally conjure up that situation? Here’s a picture below. 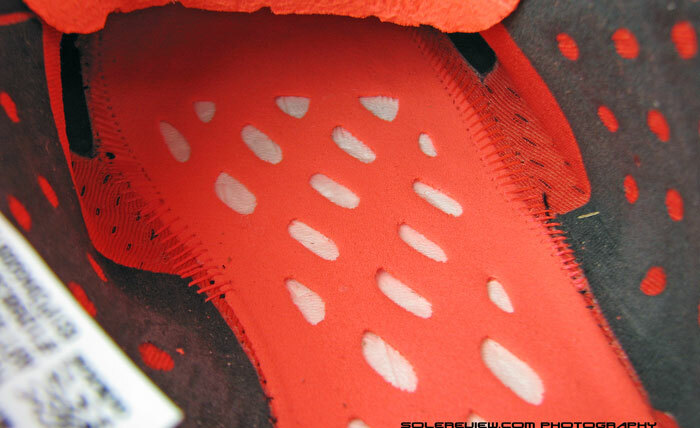 Notice that there are dirt marks on the midsole wall, meaning it touches the ground along with the outsole. A good 10mm at its widest point. Insane. What’s really happening here is that weight of the foot tends to compress and flatten the medial midsole base, dangerously tilting the foot inwards. Needless to point out, there’s zero arch support, the midfoot perched precariously over the thin midsole waist. Isn’t that the weirdest sight ever? No, not the shoe hovering over a Mac, but the dirt marks on the midsole wall. 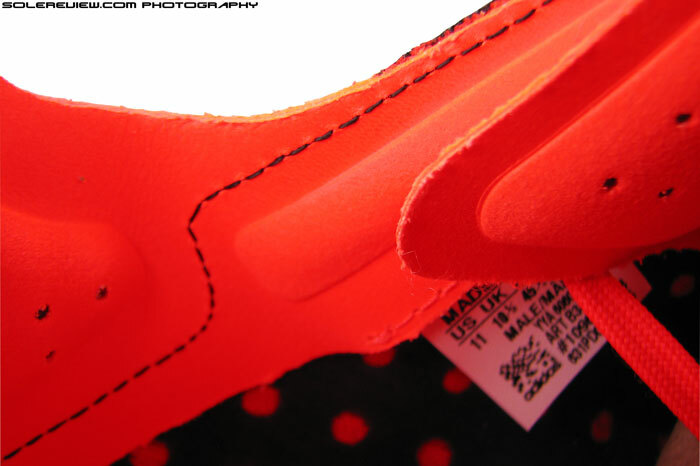 This shows that part of the midsole actually functions as the outsole – there is so much inward roll. Running in a pair of PureBoost makes you believe in a higher power that is the medial post or a firmer midsole, and how they actually do their bit in many running shoes. Would also like to highlight that the forefoot is quite thin, so if you’re running on any surface which has pebbles or similar debris, every one of them will make their presence felt through. So if you’re brave enough to include the PB in your running shoe closet, make sure they do duty only on smooth, clean roads, track or treadmill. Rubber is very soft, yet lacks grip. Durability better than expected, but far lesser than traditional rubber outsole. Outsole grip on the PB is appalling. 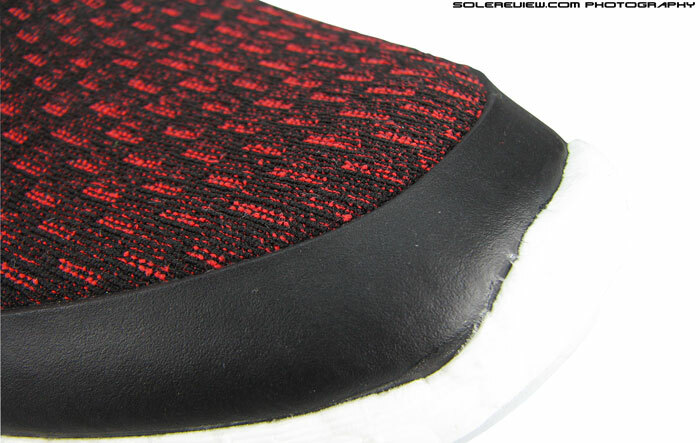 Like we mentioned earlier, the outsole is soft yet far from sticky. Absence of any lugs or traction increasing texture makes it worse. Throw in some dampness on roads, and you’re looking at a potential slip trap with slimy debris filling up the space(s) in outsole cutouts. On the bright side, the outsole durability fared much better than expected, with lesser wear and tear seen initially. The likely explanation is that the soft outsole sinks into the midsole with weight loading, reducing frictional forces. The front silhouette looks like a straight lift from a black and brown dress casual. Narrow and pointy. The shoe is rather narrow in the front, so you should look at a half size up. The upper has its share of Gremlins too. Even with taking into account the mandatory half upsize which comes with adidas territory, the forefoot is super snug and toe area pointy with a shallow height. A bird’s eye view of the forefoot leaves little doubt about the shoe’s European origin and designer sneaker bias. Slim profile more at home on dress casual silhouettes. It isn’t tight though, and not our major area of complaint; the tongue and collar area is a cause for concern, however. Tongue slide happens almost immediately into a run; it goes laterally sideways into the upper, bringing up the medial pointy edge into contact with the foot. The fused-two-layer tongue is a bit stiff and tends to poke in, but with medium thick socks worn, it should not cause any trouble. The lacing pressure is inconsistent, though. The rubber eyelet makes it a struggle for the laces to slither through, and even with sufficient cinching pressure, the front (first row) ends up being slacky, and tight near the ankles. Collar edges flare out on all sides, providing little when it comes to grip. 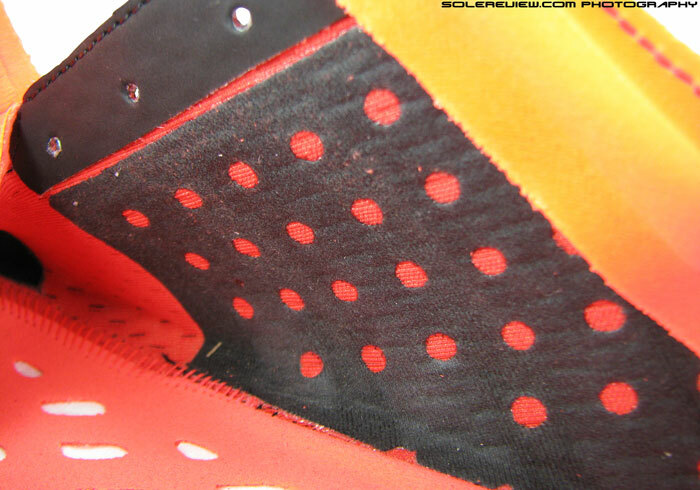 The foam pockets inside the heel salvage the situation somehow. Collar grip is practically non-existent. Even with true sizing, you can easily run two fingers around the gap surrounding the ankles. The rectangular, embossed padding near the tongue is useless, and only solace comes from the pockets inside the heel area. They seem to offer marginal grip, and keep the foot from slipping out. Otherwise, the collar edges flare away from the foot, with the material flanking the Achillles dip actually flapping outwards. The collar edge and tongue come together to poke when worn barefoot. There’s been some talk online about how the PureBoost is comfortable even when worn without socks. Allow us to quickly burst that assumptive bubble. We actually ran just over five miles without socks, and we did not risk doing any more barefoot runs lest injuries happen. The major issue with going barefoot in the PB is that the fit alters significantly without socks, and there’s nothing between your skin and some of the harsher elements on the upper. 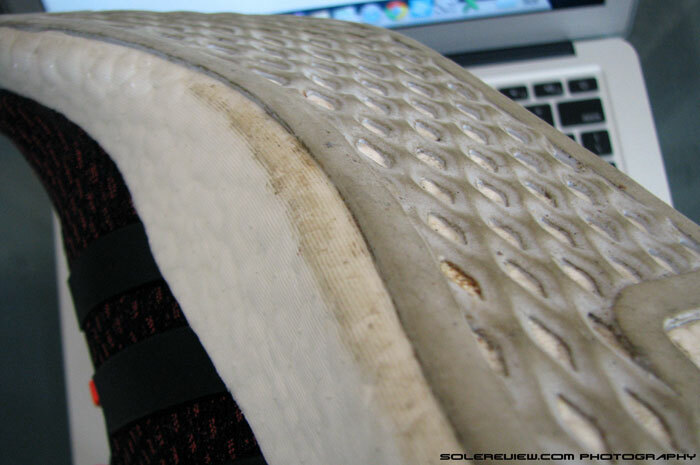 There are three things which we found in the PureBoost which makes it unsuitable for use without socks. 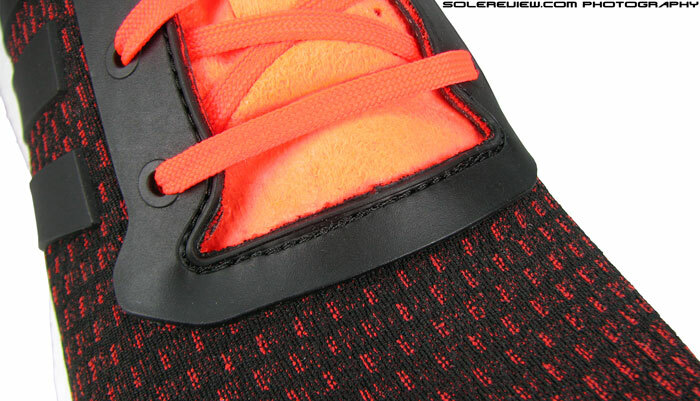 First is the area on medial side of the upper, where the last eyelet and tongue overlap each other. 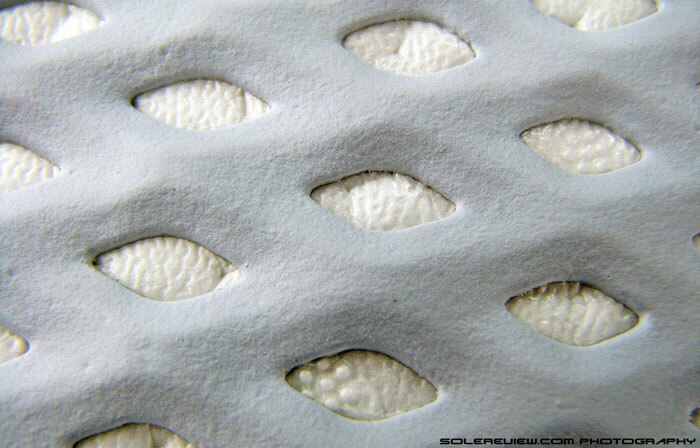 Now recall that the eyelet curve is a three layer component – two of synthetic and one of rubber overlay. Add to that another two layers of the tongue, and you have something very stiff and pointy. Without socks, the two opposing ends of the eyelet come closer, bringing all the materials together too. This bunch of materials digs into your skin, causing noticeable discomfort. We felt this mostly around the medial (inner) side, but the lateral side can also be potentially damaging. If this wasn’t enough, just 30 millimeters below that is a thick internal overlay made of synthetic, and this grates against the skin too. Very irritating indeed, and the most serious of the issues. Move over to the front, and the spot where the rubber toe bumper meets the mesh catches on the front of your toe. This is only felt when barefoot, and not when worn with socks. 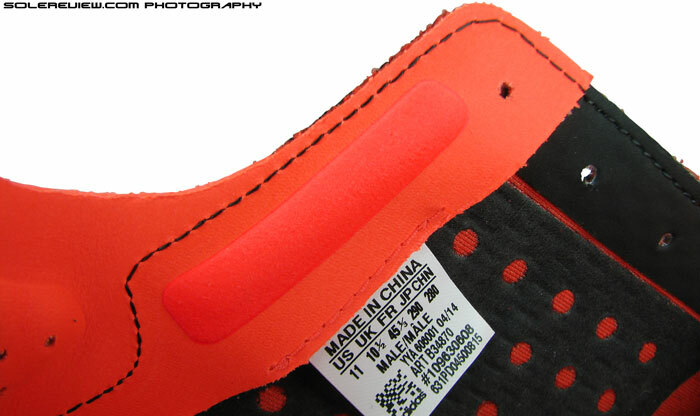 Another potential area of concern is the foam padded pocket in the heel lining. With sweat, they tend to stick to the bare skin. Not a deal breaker, but some people might not like that. The perforations on the strobel sheet isn’t a bother when going barefoot in the Pure Boost. Feels a bit rough, but nothing bad comes out of it. 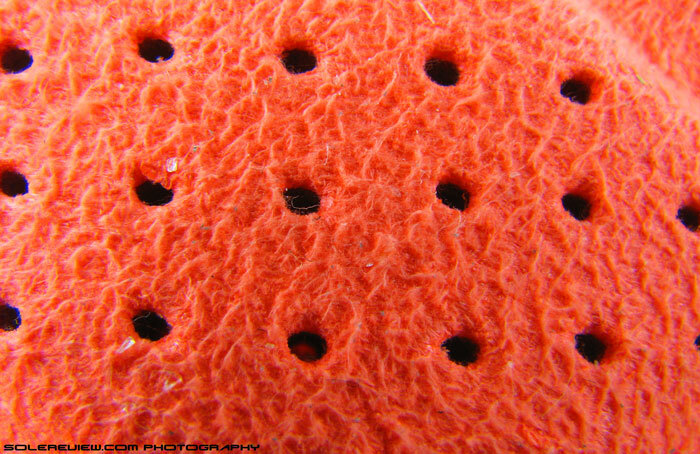 The strobel is perforated and feels rough to the bare skin. While it is certain that the feel could have been improved with a smooth footbed, we did not find any negatives worth mentioning in the existing set-up. Just feels a bit raspy, that’s all. A bit like barefoot walking on a synthetic running track. Is there any redemption for the PureBoost Reveal? Only one we can think of. If you’re not running in these shoes, wear socks, and restrict usage to walking around town, then this is a good shoe to do that in. The PureBoost midsole is very well cushioned at walking speeds, and the shoe is relatively lightweight. Talking of weight, we observed that the left shoe was 14 grams (5% heavier) than the right, for no obvious reason. All things being the same, it has to be the molding variance of the Boost foam. adidas describes the PureBoost as an intersection between performance and lifestyle, but in reality it’s a one way street. The PureBoost is as much of a performance running shoe as the Nike Roshe Run or Air Presto is, with more emphasis on form and lifestyle elements rather than running footwear function. It’s misleading to label the PureBoost as such, because this shoe isn’t meant for that. 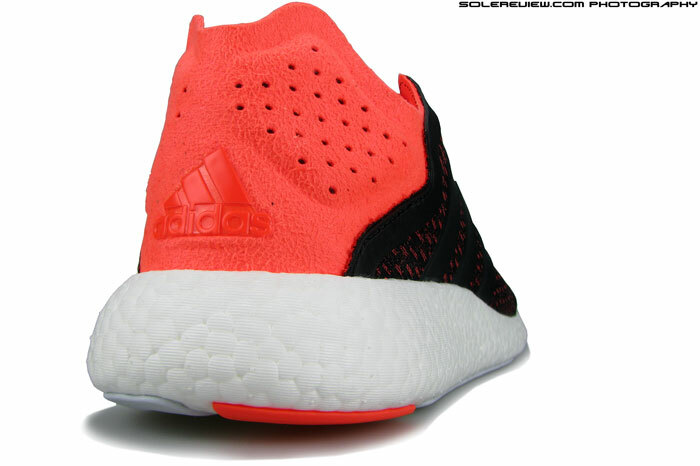 There are other shoes from adidas featuring the Boost foam, and they do a far better job as running shoes – names like the Adios/Energy/Glide Boost come to mind. And if you still want to use the PureBoost as a running shoe, do so at your own peril. Note on ratings: Our numeric scoring of 5.5/10 is based on a total of weighted averages. The attributes namely transition, stability and fit contribute to 69% of total scoring weight, which we see as more important than material (7%), cushioning (7%), traction (12%) and weight (5%). Hence the scores will not add up when a method of simple average calculation is used. Well that was a fun read! I guess Boost material can be too much of a good thing 😉 I’d gotten that feeling a bit with the Adistar Boost but that was also due to the “stretch” upper. I think that for walking around town I’ll stick with my el cheapo Skechers Go Run Ride 2s. Pureboost is proof that adidas is like a kid who had too much Candy to eat, and now suffers from indigestion. Any chance you will do the in between model? Climacool Rocket Boost. Thanks for the suggestion, but it is unlikely we’ll review the Rocket Boost. Thanks for reinforcing my opinion that you guys are completely honest in your reviews. These came out of the box and went right back after about 45 seconds walking around the house. I am truly surprised and impressed you managed 5 miles in them. The support is far far worse than going barefoot. Thanks. Actually managed 15 miles on them – 10 with socks, and 5 without. A very brave thing to do. Sure, Mizuno and NB’s are coming up soon. We will review the Wave Rider 18 and Sayonara 2 this month, and NB Fresh Foam 980 and 1260V4 will follow soon. Hurricanes would be a great addition too. Finally found a replacement to my Guides and personally I love them. New Hurricane and Triumph should release near same time. Will cover that then. Hi. I’ve always been an Asics guy, but was trying out shoes down at the shop yesterday and the Boost piqued my interest. I tried on the Energy Boost Reveal and loved the cushioning. Didn’t expect it from an Adidas. So I came home and did some research and came across your reviews on the Pure Boost Reveal. I’m just curious how the Energy Boost Reveal will stack up against the a Energy Boost 2.0 and the Pure Boost Reveal. Will it be good for running? The ‘Reveal’ part just refers to the fabric used on the upper. The Energy Boost Reveal shares a lot in common with the Techfit version, and should be a great running shoe nevertheless. The Pure Boost is ‘purely’ a casual sneaker, so do not run in them. They’re terrible when you do. What do you think about adistar boost? Thanks. Haven’t tried them, so can’t say. They were comfortable on the soles but the fit is horrible! Afterwards i felt i should have gotten a 1/2 size smaller because there is a gap around my ankles. I can feel the socks rub against my heel. The toe box and width are good but the security around my ankle is non-existent.. I hate i spent 120.00 on these shoes so now i feel i have no choice but to utilize them. Thanks for the feedback. Just don’t run in them, because the shoe’s stability is terrible. mis-categorized and overpriced yes, but overall a comfortable shoe for lifestyle wear. A course this article reviewed the shoe as a performance shoe which doesn’t do the shoe any favors but also the $140 price is up surd. I bought the Rocket Boost Clima Chills on sale for $70 but I found the shoe ran big and I should have sized down a half a size since the mesh gave a loose feel. 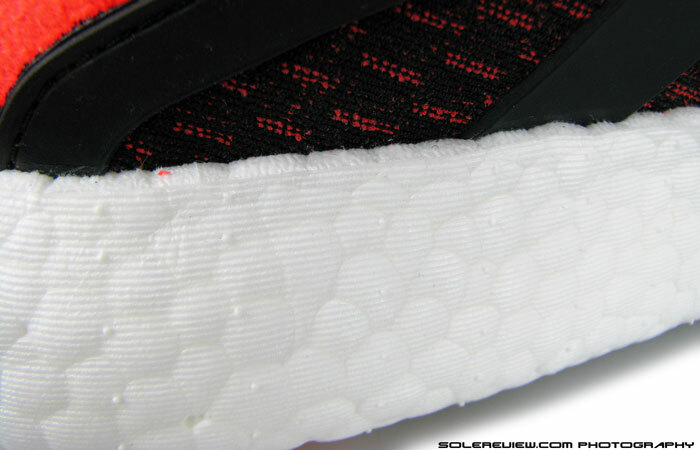 Also the shoe’s toe piece started to peel off out of the box and the soft bubble feel the Pure Boost line is known for wasn’t as apparent in the Clima Chills. I returned the shoes and dismissed buying Boosts again. Well until now since it’s the end of the year and now select Pure Boosts are $90 and select Reveals are $70. I just bought a pair of the Reveals and actually got them for $65 since customer service messed up my order. I don’t plan to run in them and I ordered a half size down this time. I plan to use them as a comfortable walking shoe and for $65 I can justify the price. $65 is a great price for a casual shoe, so good on you! I run in them 10-13 miles every Saturday with no problem. 6ft 178lbs. Love the bounce and how light they are. Maybe if u are heavier or over pronate, maybe I can understand the problem . What other shoes do you run in, and how do they compare with the Boost? Probably of more interest for runners, the Sen 3 Boost : http://www.wiggle.co.uk/adidas-adizero-takumi-sen-3-shoes-ss15/ – now that could be something with the boost material under the forefoot. I’d given the Sen 2 a try but they were really too firm coming from the Adios Boost 2. Good to hear, I didn’t even know it existed until today! Is it already avaliable in the US ? The Ultra’s? Not in the US yet. TS-3’s should be in the US another 10 days or so. Owning a pair of Energy Boost 2 and a pair of Ultra Boost.I personally find the Ultra WAY overated.I’ll steer well clear of the PB after this review too..The more minimalist AB shoes are meant for faster near perfect form runners so -average Joe- beware.The Ultra Boosts dig painfully into my upper foot where the plastic stripes are and provide nothing like the superb push off response I get from the EB2..They feel very flat and slipper like….Frankly the EB2 are much better shoes for the majority of frequent runners.Better to save them for your races though or wear the sole down too quickly. Agree – the EB is a better shoe than the UB. And the PB is absolutely horrible. Agree. No harm in calling in positioning the Pure Boost as a lifestyle sneaker – so why label it as a running shoe and have people potentially injure themselves?